South of Bristol, TN, just below the South Holston Dam, is a wonderful recreation area on Osceloa Island. Although folks in Bristol know all about the Weir Dam, I don't find much online about it. If you know of any good websites, please comment below. But this is a great place to take visitors to introduce them to the beauty of northeast Tennessee. There's fishing, picnic tables and a nice trail that makes a 1.5 mile loop around the island. But the real attractions are the weir dams. They were constructed in 1991 on both sides of this island to add oxygen to the Holston River when the TVA is not generating electricity. As you can see, it's as if the TVA constructed 72 waterfalls (12 rows of 6), all of them thundering at once. To hear what this sounds like, click here for video (this is of the smaller weir dam on the far side of the island). 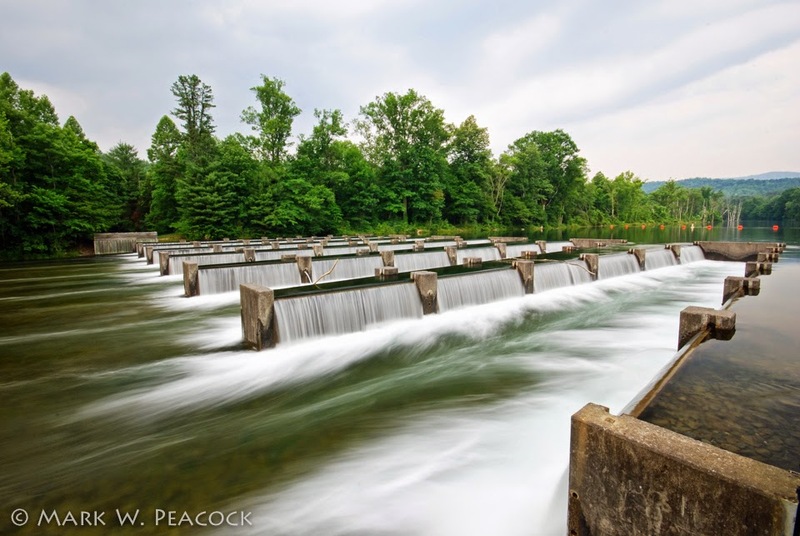 Keep in mind that this scene only happens during times when the TVA is generating at the South Holston Dam (about a mile upstream). 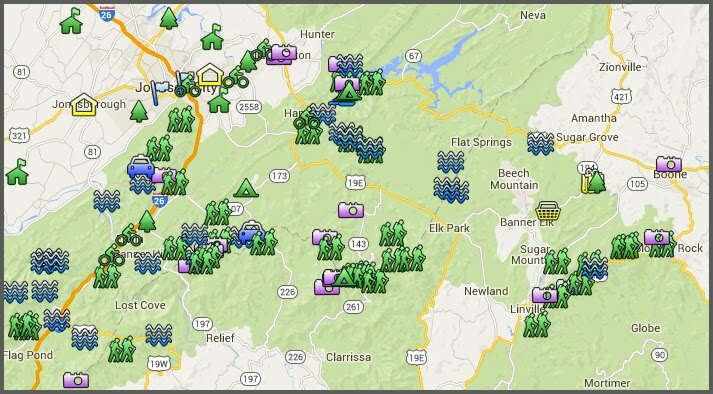 So before you head out, go online (here) to see their schedule for releasing water (Click on South Holston in the "Choose a reservoir" drop down menu). Directions: From the intersection of routes 394 and 421 south of Bristol, continue 2.9 miles south on 421 (toward Shady Valley). Turn right onto Emmett Road/Holston View Dam Road. Continue for 1.6 miles (bear right at the fork) to the recreation area on your left. Where to next? After taking in the sights and sounds at Osceola Island, get back on Holston Dam View Road and drive 2 more miles to the top of the dam. Here you will see a beautiful view of South Holston Lake. That's awesome! Great photos Mark and thanks for the video. Shelley's Chicken House is no longer there. It has been bought and sold and turned into so many things since Shelly sold it back in 2006. It kept her name untill late fall 2007, and the name began the changes then. I do not know what it is as of this writing. It was empty the last time I was by there, and had been that way for a year. The old Shelley's Chicken House building has held a Small Engine Repair shop since last spring. Based on all the junk they've hauled in and piled up, it appears that they will be there for a while. I walk the 1.5 mile loop everyday and it is more beautiful and peaceful to me with each walk. I can add another .3 miles to my walk if I park in the first parking lot and take the short trail along the river to the bridge where the main trail head is located. In addition to the 1.5 mile loop, there are 3 other advertised trails and one unadvertised (but hiking permissible) trails in this recreation area. The Emmett trail is 1.1 mile one way. Access it from either end. On one end, park in the first parking lot to the right at the boat ramp just before crossing the bridge over the river upon entry into the recreation area. The trailhead begins at the kiosk and runs through a wooded area along the river. It then turns and goes through an open field for a short while and ends with an easy uphill climb underneath trees to the second trail head parking lot on Piney Hill Rd. Return the same way. The trail is marked with sign posts. The entire trail is easy. The second trail is the Tailwater Trail. Park in the first parking lot to the left, just past the bridge. Pass underneath the bridge to find the trail head, marked by a kiosk. Follow the trail .5 miles to the second parking lot with a kiosk. Return the same way. This trail mostly follows the river but the short last leg is through a wooded area. Both trails were, until recently, dirt paths, but the TVA employees, who love to play with there large equipment toys, recently unnecessarily graveled both trails. I've left the best trail, which is actually a wide road bed accessible by only TVA vehicles and hikers, for last. It is the "Spillway Trail". It is not advertised, but TVA allows walkers and hikers on it. To access the trail, follow the signs to the dam. Just before the dam, on the right there is a gravel parking area that will fit about 8 vehicles. There is no kiosk, but the trailhead is obvious. Walk 1.7 miles on a wide gravel road bed, built for TVA vehicles only, on a slight uphill grade. (I walk the island trail on weekdays and call this my weekend workout because this trail raises my pulse rate and breathing). At the end, is an open field with a Spillway and access to the lake where you can sit on the bank and dip your feet into the water. There is a gorgeous view of the Holston Mountains and there may be visitors there by boat. Return the same way, for 3.4 mile RT hike. All of the trails I have mentioned are lightly trafficked. The island trail in this blogpost is the most popular but I think that is most unfortunate because everyone should visit these other trails at least once. I will also note that on these trailhead kiosk maps you will also see the 1.5 mile Bouton Trail Loop. This trailhead is outside the recreation area. I walked it once and found it to be uninteresting, lacking sufficient tree cover in hot sunny weather. It is an area carved out by fly fishermen and probably also now graveled since the TVA boys like their toys. The view of the river is minimal and unimpressive.